In the midst of yet another sports season (lacrosse), I'm realizing the family dinners that have always been so important to us have really gone by the wayside. I'll bet we sit down together less than 3 times a week at this point. I'm making dinner earlier and earlier to get to practice on time - my two younger ones need to eat early and get to practice, my older one isn't hungry yet, and The Big Guy hasn't even left work by the time I'm cleaning up and heading out! This is insanity! How do the "experts" who tell us how important family dinners are do it? What is your evening schedule? I'll bet Gina or some of my mothers of teens have been there done that. In the meantime, I'm feeling rushed, overwhelmed, guilty, and hungry! 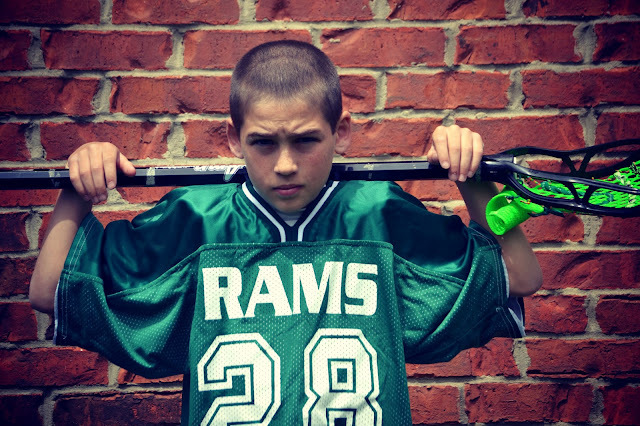 Looking forward to the end of LAX season and the beginning of summer break. I remember this problem when my son played baseball. Things got better once they could play school sports. Sometimes we would do a pre-dinner after school and before sports, and then a late dinner after sports so we could all eat together. Lets see..... Last night my husband (he coaches her team so he has to come home early on some game nights) and daughter ate at 4:15 so they could get to her softball game on time. Then my son, youngest daughter and myself ate about 45 mins later before he had to get to his game. Seriously... I LOVE family dinners, but you're right the more kids in sports, the harder it is to sit down together. I'm lucky in that my husband gets to work around 7am and is home around 4:30/5 most days. It is hard to eat early, but we are beginning to adjust our internal clocks (tough for my kids who eat lunch at 1pm at school!). I have a friend who will once in awhile have "carpet picnics" with her husband ~ just the two of them after the kids go to bed (which at their house is at 8 ~ that would NEVER happen at my house. The kids' games didn't even get over until 8:30, then the gathering of equipment, drive time, showers and baths and its already 10. ) But it is a fun idea. Family dinners are important and I think as long as you do it when you can ~ or have as many sit down to the table at the same time as are able, and continue to chat about their days etc, the positive effect of them will still be felt! Switch it up. Who says it has to be dinner that you sit down for? Breakfast works, so does a before bed snack around the table after everyone gets home. I got nothing for you-it's a constant struggle around here too. It got even worse when my daughter starting doing high school sports. They practice after school and would finish about the time I would need to be headed out the doors with my boys. It always sounds like a rushed chaotic mix of everyone running in different directions...trust me been there. At one point I had one boy playing JV and Varsity football with the other playing junior high and a daughter playing volleyball. You can't always sit down for a family dinner but it does make it special when you can. Also as they get older you can have some pretty good (open)conversations in the car when they know that nobody else can hear what they are saying or what questions they are asking.